While motorsport is one of the most popular sports in the world, it doesn’t have much of a fanbase here in the US outside of NASCAR. Unrealistic portrayals of race cars as children aid the problem, with most model cars sold unable to capture the nuances of full-size racing vehicles. Change that, and the potential for a more engaged audience skyrockets. Straight out of the home of heavyweights like BMW and Porsche, the DR!FT model race cars are the first toys to accurately replicate the many subtleties of motorsport-ready sports cars, all without any specialized track necessary. 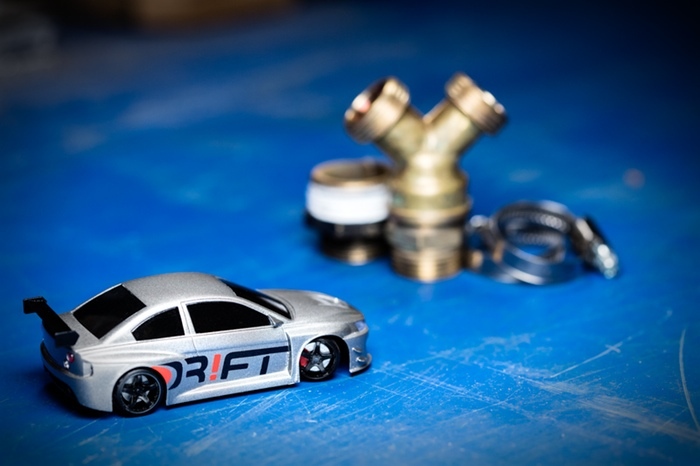 This means that DR!FT model cars perform with real racing dynamics that are true-to-scale, allowing them to accelerate realistically, reach a believable top speed, brake authentically, and even drift. It even comes complete with different engine sounds along with simulated brake and tire sounds. All this is controlled from a companion app that interfaces using Bluetooth, allowing racers to not only control the DR!FT model car but also tweak its engine, add accessories and change its handling, allowing for a deep level of customization to keep things fresh. A Red Turbo DR!FT model car or a Silver V8 DR!FT model car is available for about $160 and is slated to ship in August 2017. The DR!FT Kickstarter campaign is looking for about $86,000 by December 31st, 2016 to see success. DR!FT model cars are a breath of fresh air in an otherwise stagnant segment. By adding realistic physics to a classic toy, children and adults alike will be able to not only engage in more thrilling play sessions but also work out their problem-solving skills in how best to tune their vehicles to win. Add in the possibility of using its variety of sensors to do things like detect a finish line for exact lap times or even potentially race others virtually, and DR!FT brings the world of motorsport alive moreso than a product like the 3DRacer.